Rock Salt & Ice Control HQ  (a Duke Company) offers a variety of snow/ice removal solutions. Specifically we carry American Rock Salt and Vaporizer Ice Melt Flake We provide fast delivery throughout New York as well as surrounding states. If needed, our A+ customer service offers expert advice, ensuring you have the right tools and/or products that best suits your needs. We proudly carry American Rock Salt: bagged, bulk/wholesale or by the pallet. We also carry a variety of Deicers including EnvironMelt (in bulk/wholesale, bagged or pallet). Likewise we carry the  Construction Electric Heater Rental – the Patron – E1.5 hydronic ground/surface heater. 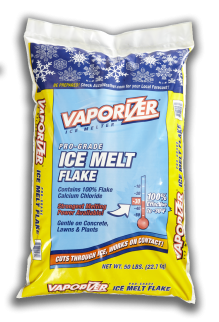 Rock Salt and Ice Control HQ (a Duke company) also carries Vaporizer Ice Melt Flake. About the Duke Company Since 2004, the Duke Company has proudly been serving Ice Control professionals throughout New York State with: exceptional pricing, outstanding ice melting products, equipment and tool rental, prompt delivery and outstanding customer service.